In the most comprehensive study of its kind, an international team of scientists led by University of Miami biologists has found that tropical and subtropical forests across South America's Andes Mountains are responding to warming temperatures by migrating to higher, cooler elevations, but probably not quickly enough to avoid the loss of their biodiversity, functional collapse, or even extinction. Published November 14 in the journal Nature, the study confirmed for the first time that, like many other plant and animal species around the world, trees from across the Andean and Amazon forests of Colombia, Ecuador, Peru, and northern Argentina have been moving upward. But unlike species from the world's temperate or boreal forests, which are far more accustomed to dramatic seasonal shifts in temperature, tropical trees are running into environmental roadblocks at higher, cooler elevations that are thwarting their migration and threatening their survival. "In the Andes, the ecosystems can change very fast and very dramatically, for example, from sunny and dry premontane forests to sopping-wet cloud forests. 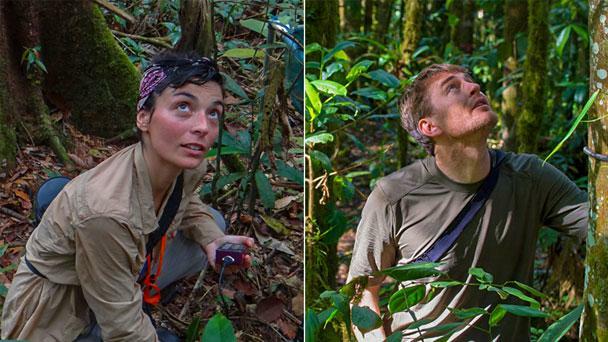 These changes, called ecotones, appear to be blocking species migrations," said lead author Belén Fadrique, a Ph.D. candidate who designed and carried out the study with her advisor, Kenneth J. Feeley, UM's Smathers Chair of Tropical Tree Biology. "These ecotone barriers make it hard for plants to relocate their populations–and if they can't relocate, they will go extinct." For the Nature study, Fadrique and Feeley set out to answer a scientific call to include more tropical plants in studies that investigate and predict the effects of climate change–the very call that Feeley and his fellow tropical biologists have been issuing for years because, as he notes, "the tropics include most of the world's species and we know next to nothing about what those species are doing or how they are responding to climate change." Aiming to fill that void, the UM researchers joined forces with 18 other researchers from around the world to create a new database that tracks the livelihoods of thousands of highland trees in 186 plots of land situated throughout what is known as the Tropical Andes Biodiversity Hotspot. Sitting at elevations from 300 to over 3,000 meters above sea level, most of the plots are about the size of an American football field and have been inventoried multiple times over the past couple decades. Collectively, these forest plots contain an astonishing diversity–a total of 120 different plant families, 528 genera, and more than 2,000 tree species. As Feeley notes, that's more species of trees than are found in all of the United States and Canada combined. Using newly developed modeling techniques that combined the data from all the plots into a single comprehensive analysis, the researchers confirmed that, as temperatures in the high Andes rise due to global warming, heat-loving tropical trees are seeking more optimal conditions by migrating to higher and cooler altitudes. Consequently, the abundance of these heat-loving, or thermophilic, species in the study plots is increasing over time while, in contrast, the abundance of cold-loving species is declining. The researchers were also surprised to learn that, while this phenomenon of thermophilization is widespread across the Andes, the rates of the change in forest composition are not uniform across elevations. They suggest "ecotonal roadblocks" may be, in part, responsible. In other words, as Andean species get pushed upslope by rising temperatures, they may quickly find themselves out of their comfort zones as other aspects of their habitat, such as rainfall and cloud cover, become intolerable. "Thermophilization is a mouthful of a word but it means that forests are becoming more heat-loving over time because, as the world warms up, the species that prefer the cold are being kicked out or are dying off and the heat-loving species are moving up and taking their place," Feeley said. "Everything is moving up the mountain so the species near the tops of the mountains are running out of places to go and may soon face the risk of mountain-top extinction." Feeley and his colleagues have published other studies examining the effects of climate change on tropical forests in different areas, but none with such a broad continental scope. Which gives Feeley both confidence–and pause–over the study's conclusion: "Andean forests must be added to the growing list of ecosystems and species that lack the ability to quickly and cohesively respond to climate change and thus face high risk of extinction, biodiversity loss, and functional collapse." "Tropical forests are one of the most important players in the world's global carbon cycle," Feeley said. "They slow down climate change by taking a lot of carbon out of the atmosphere and putting it into their growth. So the faster climate change happens, the faster we will lose our tropical forests, which in turn means that climate change will happen even faster." In addition to Feeley and Fadrique, researchers from the following organizations and institutions contributed to the study, "Widespread but heterogeneous responses of Andean forests to climate change:" Escuela Politécnica Nacional in Quito, Ecuador; the Consortium for the Sustainable Development of the Andean Ecoregion; Universidad Nacional de Colombia-Sede Medellín; Universidad Nacional de Tucumán, Nacional de Investigaciones Científicas y Técnicas and the Universidad Nacional de Jujuy in Argentina; Wake Forest University in Winston-Salem, North Carolina; Universidad Nacional de San Antonio Abad del Cusco in Cusco, Peru; University of Oxford in the United Kingdom; University of Texas at Austin; University of Amsterdam in the Netherlands; University of Göttingen in Germany; and Universidad de Cuenca and Universidad Nacional de Loja in Ecuador.